Sometimes, it's the little things that make a HUGE difference. Monday night was bad for me. I came home to an empty house, the Mr. is back in school but thank God this is the last quarter. My professional life is lacking at best and to top it all off - I went bathing suite shopping. The experience wasn't too bad but I got frustrated because the ones I liked were too big. So, when the Mr. came home I started crying. We've been married for almost a year and seeing me cry makes him sad which makes me very happy. He tried to comfort me but by then I just needed to shed some tears and feel sorry for myself (not a good look by the way). He let me cry and say everything that was in my heart which was nice and by morning time I was feeling tons better. 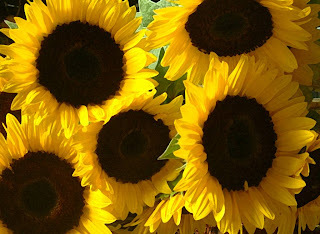 I felt even better when I came home from work the next day to bouquets of gorgeous sun flowers and daisies! I'm very blessed and like someone said to me "I have a lot to be thankful for" starting with the Mr. If you read this, know that I love you with everything I have!